Nolan North is a voice actor. Some of his credits include the voices of Deadpool in Hulk vs. Wolverine, Cyclops in Wolverine & The X-Men, and Nathan Drake in the Uncharted video games. North also portrayed several characters from the Transformers franchise, such as Cliffjumper, and Bruticus from the Transformers: Fall of Cybertron video game, and Smokescreen, from Transformers: Prime, the CGI cartoon show. 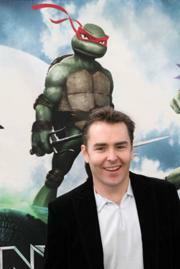 North portrayed Raphael and his alter-ego, Nightwatcher in 2007’s TMNT movieand video game. North also has a role in Teenage Mutant Ninja Turtles (2012 TV series). He is voicing The Kraang and Commander Grundch.